Varley-Woods cars were the product of two men Vernon Varley Grossmith and Robert Woods. Varley was a member of the Grossmith family, many of whose members were associated with both perfumery and the arts, particularly as singers in light opera. Two of them, George and Weedon Grossmith also found fame as the authors of "Diary of a Nobody", a satire on the life of the aspirational lower middle classes, which still has great appeal today. Around 1918 Varley dropped the surname Grossmith because of the anti-German feeling at the time, and became Ernest Vernon Varley. In 1918 Ernest Vernon Varley, and two partners, C. and D. Graham founded the High Speed Tool Company. They acquired an empty laundry in Shaftesbury Road, Acton, and a nearby wooden workshop in Hanbury Road. They began with a capital of £5,000, and obtained a £35,000 mortgage for the property from the London City and Midland Bank. This also provided working capital for the project. Unfortunately the business soon failed and was sold off in 1921 for £5,000. One of the shareholders of the High Speed Tool Company was John Robert Woods, an adventurer and merchant who had been making a living trading up and down the rivers of the near east. 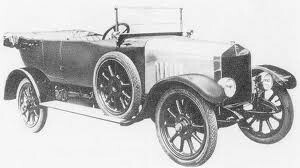 In October 1918 Varley resigned from the High Speed Tool Company, and in July 1919 joined forces with Woods to form H. S. Motors (High Speed Motors) to produce the Varley-Woods car. The cars were launched at the 1919 Motor Show at Olympia. There were three models, a 2-seater, priced at £540, a 4-seater tourer, priced at £660, and a coupé, priced at £760. The cars were not a success, and the company’s financial problems increased. As time went by, it seems that more and more of the work on the cars was carried out by Turners in Lever Street. In reality their venture into car making was probably doomed from the start because of continuous cash flow problems. When cars were ordered, they were often never delivered, possibly because the business had run out of credit with some of the component suppliers.